Great musical ideas need a solid foundation of strong chops to back them up. Fill the gaps in your technique with this unique approach to rock guitar. Build your finger strength, flexibility, and independence with exercises and examples written especially for rock players. This book explores all the important soloing techniques such as speed picking, sweeping, tapping, harmonics, scale sequencing, and more. Develop your chops while practicing exercises in the style of the music you enjoy. 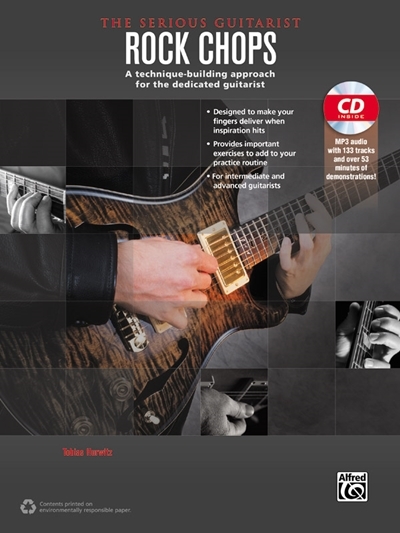 The Serious Guitarist: Rock Chops provides the tools you need to become a better guitar player, but more importantly, it will help you become a better musician. The included companion MP3 CD features demonstrations of the examples in the book. Chapter 21: "The Flight Of The Bumblebee"